A fun find! Looking around for Gingerbread Men to put in the yard, we happened upon this bit of uniqueness. 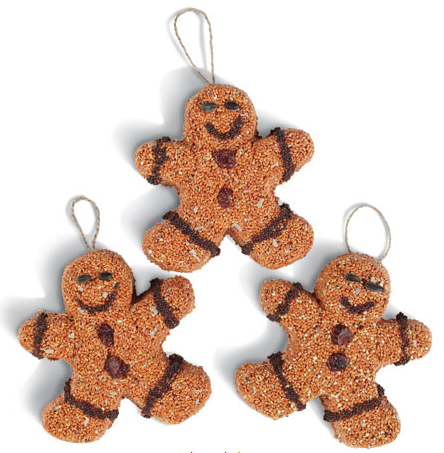 Gingerbread Men made of birdseed. We can’t forget out little flying friends so why not have our Gingerbread Men decorating our trees and bird cages?! Of course it will be sad to see our little Gingerbread Men go, but the birds will be happy and for a while you had Gingerbread Men everywhere you look. The description says they are weather resistant so they can be used outside too. Might be fun to have these outside even if we don’t have birds looking for lunch.